Technology is now essential to our daily lives. Accessibility and empowerment has transformed how we connect and communicate. This has led to new forms of user interaction that will usher in the business models of the future. 2017 will be comprised of new types of conversational experiences to connect with consumers. It will see the continued evolution of artificial intelligence and connected systems as well as the rapid rise of third-party ecosystems supporting virtual, augmented and mixed reality. 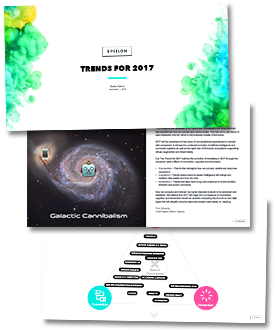 Our Top Trends for 2017 outlines the evolution of marketing in 2017 through the consumer centric filters of connection, cognition and immersion. Fill out the form below to get the top trends.